For more information on the new classes starting in December look no further, this blog is dedicated to explaining just what to expect from these sessions! Every class covers key aspects of martial arts. However, each of these will specifically focus on a certain aspect of training to cater to every level. Our classes will be ranging from complete beginners, grading for their white belt, all the way up to 1st dan black belt. Mondays will focus on coordination for beginners. This is an extremely important aspect of martial arts that is often taken for granted at later stages. Helping enhance coordination skills at a young age can be very effective and this kind of training can be extremely beneficial, especially when taking into account the transferable skills that can be used in other sports, e.g. hand to eye coordination. These sessions will incorporate basic technique work, explaining them simply and easily to help complete beginners get used to the sport. We will usually do line work, made up of short combination which with help foster both better kickboxing style movement and also help children to get used to each of the moves and use them a practically. Our beginners lesson would always finish with a fun game, we find this gives the children to something to look forward to at the end of class when attention can start to dwindle in the younger ones however still develop their skills that can transfer directly or indirectly to martial arts training. These sessions would progress on from the beginners’ lessons into more intermediate work. This would allow intermediates to hone the basic skills they have previously learned through longer series of combinations, simultaneously helping to improve flow and progression through moves. We also teach a few more advanced techniques in these lessons such as turning kicks, sweeps and take downs. The Tuesday’s intermediate session also includes a monthly challenge tailored to children. This can vary from a fitness challenge such as holding plank for the longest time or a kickboxing based challenge such as doing the most roundhouse kicks in 1 min. The results for each individual will be recorded and whoever did the best at the end of the month gets 6 of the EKA stickers, 3 for second place and 1 for third! The Wednesday’s beginner session will focus on flexibility for beginners as this is a key aspect in martial arts and is great for your body! There will be lots of emphasis on this throughout the session. However, these lessons also follow a very similar pattern to the Monday session (see above) and end with a fun game. For those wanting focus on their next grading the kata class is perfect for you! The focus will be on memorising and practicing the katas for each student’s next grading. These are extremely helpful as you progress through a martial art and a very important part of achieving the next belt. Technique Improvement: part of completing a kata successfully is making sure that each move and technique is correct. Improving these techniques then translates to other aspects of the martial art including line work, self-defence and sparring. Fitness: Going through a kata is more than just a set of moves its also a great way to exercise and keep healthy! 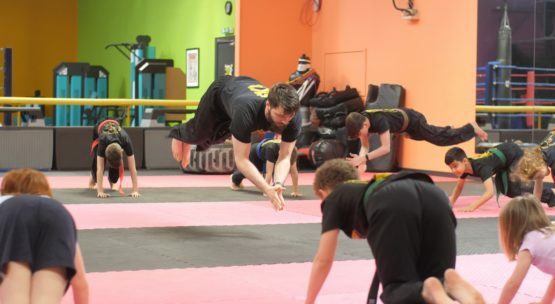 During the advanced children’s lessons we will be able to go into some of the more difficult techniques such as spinning and aerial kicks. Coming from a taekwondo background this my favourite part of martial arts and having done them for so long I can bring my knowledge of the techniques and help break it down for others to learn easily. Within a session we would build up gradually to these more technical skills. Generally a session would include a warm up, stretch, line work and pad work building up to harder techniques alongside tricks and very advanced skills that can be used in sparring or just to show off! During the sparring class we go through all things sparring! Going over tactics, useful skills for fighting and when/how to use them e.g. breathing control, correct mindset and obviously fitness once again. We will focus on certain techniques and tricks and then incorporate them into the sparring work of the session, maintaining a large portion of the lesson purely for sparring! The Saturday session will be very similar to the Tuesday intermediate session but with some key differences. Firstly, we will try to pay particular attention to improving high kicks and techniques incorporating these high kicks such as double up kicking. Second there will be no challenge on Saturdays so if you are interested in the competition of the monthly challenge then Tuesdays’ session may be for you! At the EKA we reward our younger students to encourage good behaviour so members can get the most from their training sessions. We encourage the children to go above and beyond what is required and we believe by doing something extra or being attentive during class should to be addressed. For this, we have the sticker system. Each child will be given a sticker chart to track progress on how well they are doing in the classes. This will demonstrate that they have focused during class and trained to the best of their ability. The more stickers they have the closer they are to a reward. Every child will receive a badge of their choice when acquiring 10 stickers. At the EKA, we pride ourselves on being disciplined and focused, however we also like to have fun and allow the children to express their personalities. For adults respect towards your instructor is an easy concept and is displayed well through members. For children, this is something they learn as they grow, therefore we have a strike system in place to help them understand our boundaries in what is acceptable behaviour during class. 20 strikes in a month – Miss out on next grading. Notify parent by email. 30 strikes in 2 months – 2 weeks suspension from the class. Notify parent by email. If a child receives more than 120 strikes within a 12 month period they will lose their club membership for 1 year. Our reward charts are run alongside this strike system to encourage good behaviour as opposed to punishing bad behaviour alone. Our strike procedure is not to alienate those who demonstrate unacceptable behaviour but to help educate the child in what is acceptable behaviour at class.